Shipping Day has finally arrived. The equipment that your company has spent months manufacturing and calibrating is carefully packed into custom-built padded crates and loaded onto a truck to begin its journey to your customer’s site. You are confident that your equipment is protected from bumps and bruises during transit, but have you taken precautions to avoid the silent, invisible threat lurking in the air surrounding your equipment? If your shipment encounters even mild temperature fluctuations en route, moisture can condense on your equipment and cause serious damage. Moisture protection is especially important for electronics and any equipment with unfinished machined parts (exposed metal). Anything being shipped by boat or plane should be protected from moisture. Even a small amount of saltwater can do a vast amount of damage and shipping containers are often exposed to the elements for long periods of time. The rapid changes in pressure and temperature that occur during flight introduce moisture risk, as well. Shipments travelling by truck or train within the Continental U.S. tend to be less vulnerable during transit, but can still encounter challenges if they are stored anywhere along the route. Knowing what environmental conditions your shipment is likely to encounter along its entire route can help you to properly prepare. Knowing that your package is likely to sit on the tarmac during the rainy season in Malaysia, for example, will influence which moisture protection measures you employ. To guarantee that your equipment arrives at your customer’s site in the same condition that it left your facility, you need to know more than the delivery deadline. It’s worth learning as much as you can about your customer’s timeline. Will your package be un-crated immediately upon arrival or will it be stored for any length of time? Time is moisture’s partner in crime. If a package with a small amount of moisture is allowed to sit for any significant length of time, that moisture will have ample opportunity to corrode and warp delicate machinery. Moisture protection is a must for shipments that will be stored during transit or at the customer’s site. VCIs emit chemicals that battle the corrosive minerals in water. (It’s the tagalong chemicals, not the water itself, that do the most damage.) There are three types of VCIs: paper, poly, and emitters. Poly VCI is ideal for machinery from clean room manufacturing environments because it does not generate particulate like paper VCI can. 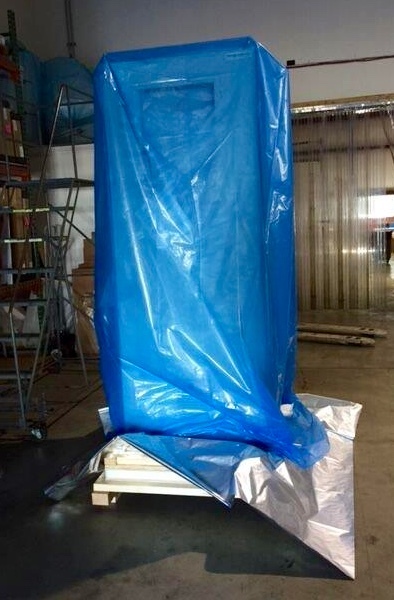 Basically industrial-sized Saran Wrap, the vapor bag is designed to prevent environmental moisture from entering the space surrounding your equipment. Equipment wrapped in vapor bag. For especially sensitive shipments, the moisture-rich air surrounding your equipment can be replaced with nitrogen, a safe, inert gas. An additional layer of plastic can be attached to the top of the crate to help shed water for packages likely to be exposed to the elements. 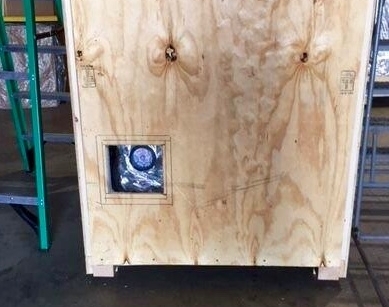 A re-usable gauge visible through a window installed in crate, the humidity monitor serves as an early warning system. 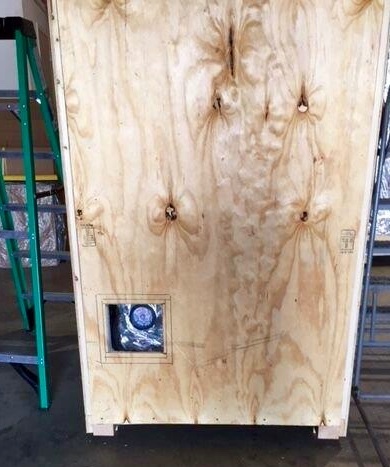 If it edges into the danger zone, the crate can be opened and the desiccant and/or VCI can be replaced to mitigate moisture damage until the crate can be fully unpacked. Humidity monitor visible through crate window. Teach your customer proper un-crating procedures. Not all moisture mitigation strategies involve products that can be packaged with your shipment. Sometimes, you need to encourage your customer to follow a better process. For example, rapid changes in temperature can spell disaster, even after the equipment is un-packed. If a package has been stored outdoors in cold weather, it should be brought inside for a minimum length of time to acclimate slowly to the warmer temperatures. Otherwise, as soon as the cold machinery is uncrated, condensation will form on delicate machine parts. 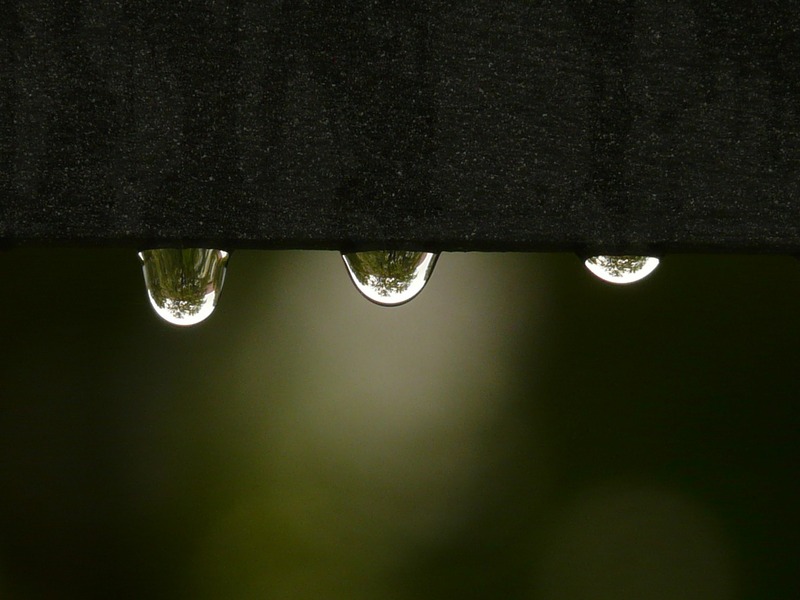 It can be daunting to consider how much damage a little moisture can do to your perfectly calibrated machinery as it travels from your facility to your customer’s site. But, with a little research and preparation, you can prevent dampness from endangering your product and your bottom line. CDC Packaging Is Here to Help! Have questions about how to protect your equipment in during shipment? CDC Packaging can help ensure your equipment stays dry and arrives safely at your customer’s site. Contact us to learn more.